Where Bloom's Digital Taxonomy deals, more generally, with the business of learning in an age where rote memorization is no longer an acceptable instructional method, ISTE NETS, or International Society for Technology in Education National Educator Technology Standards, are directly engaged in learning in the digital age. What are the ISTE NETS Standards? According to the ISTE website, ISTE NETS "are the standards for evaluating the skills and knowledge students need to learn effectively and live productively in an increasingly global and digital world." ISTE NETS standards are geared toward helping educators recognize the types of skills and knowledges that will be valuable in a modern, digital context. When combined with Bloom's Digital Technology, these guidelines enable teachers create technology rich lessons for that will help learners become successful learners. While it is still up to the teacher to determine what technology tools they will be using and how they want to use them, the NETS standards can be used as a guide for educators looking to prepare their students for the types of learning that will be important to their students in our increasingly digital and globally inclusive world. Like Bloom's Digital Taxonmy, there are six items to consider when looking at ISTE NETS standards. Research and Information Fluency - Students apply digital tools to gather, evaluate and use information. 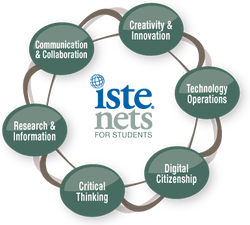 Critical Thinking, Problem Solving and Decision Making - Students use critical thinking skills to plan and conduct research, manage projects, solve problems and make informed decisions using appropriate digital tools and resources.